Giertz Gallery at Parkland College will host "The ART of Illustration," an exhibition featuring the work of artists from around the world, starting Monday, Feb. 12. 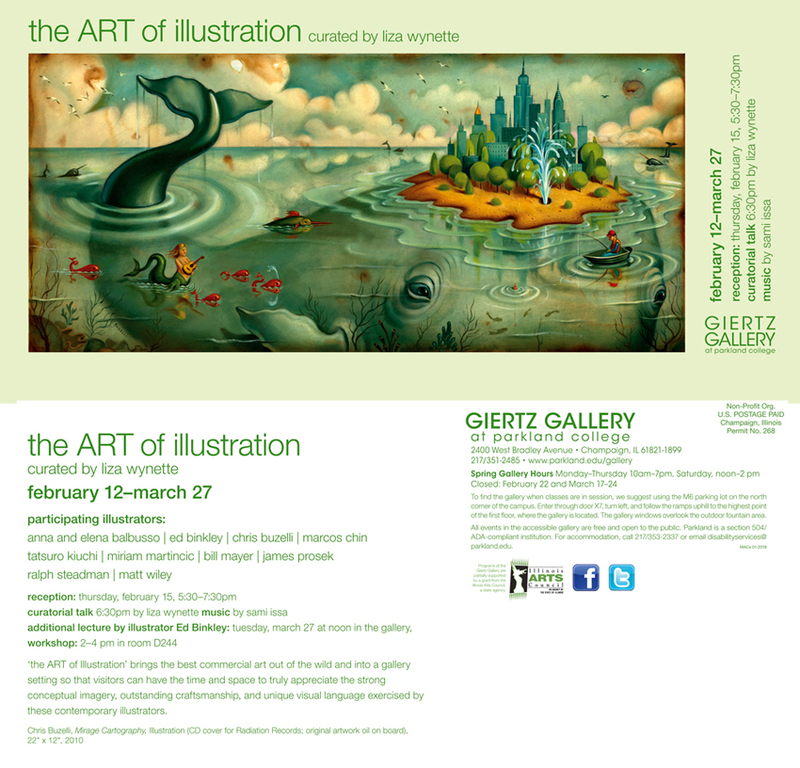 Exhibition curated by Parkland College illustration instructor Liza Wynette. She selected 10 contemporary U.S. illustrators known for their innovative work, personal style, and varying methods of creating their originals from paintbrush and gouache through digital manipulation. The exhibition will also feature books, packaging, and animation. Gallery visitors will encounter the illustrations of Anna and Elena Balbusso, Ed Binkley, Chris Buzelli, Marcos Chin, Tatsuro Kiuchi, Miriam Martincic, Bill Mayer, James Prosek, Ralph Steadman and Matt Wiley. Their works have been published throughout the world on such varied media as book jackets, children's books, classic novels, magazines, and newspapers including The New Yorker, The New York Times, National Geographic, Time, Rolling Stone, GQ, Sports Illustrated, The Village Voice, and the Wall Street Journal. The exhibit will run through Tuesday, March 27. An artist reception on Feb. 15, 5:30–7:30 p.m. in the gallery lounge, will feature a curatorial talk by Wynette at 6:30 p.m., live classical guitar music by Sami Issa and refreshments. "Artists were selected for their strong conceptual imagery, outstanding craftsmanship, and unique visual language. They are ambassadors representing the current state of contemporary illustration." The exhibit and reception are free and open to the public. For more information on the exhibit, please call the gallery office at 217/351-2485 or visit the gallery web page.